In the New York Village of Amityville sits a house that has been the subject of several books and movies. Built in 1927 at 112 Ocean Avenue, the three-story riverfront home has five bedrooms, three-and-a-half bathrooms, a boathouse and a furnished basement -- and a horrifying past. In the early morning hours of November 13, 1974, Ronald DeFeo, 43, Louise DeFeo, 42, and four of their five children -- Dawn, 18, Allison, 13, Mark 11, John, 9 -- were each shot in the back as they lay sleeping. A third son, Ronald DeFeo Jr., then 23, told police he'd found the bodies of his parents in their room when he went home. In a panic, he ran from the house and drove to Henry's Bar, which was a half mile from his home. There, he told some friends what had happened and they drove back to the house. They discovered the other bodies and called the police. Ronald Jr., also known as "Butch," was taken to the Amityville police station for his own protection after he told police he believed the murders had been carried out by a hit man. As he was being interviewed by police, they grew skeptical of his story and the next day, he confessed to the murders. He admitted that after murdering his parents and younger siblings with a .35 caliber Marlin rifle fitted with a sound silencer, he'd had a bath and changed his clothing. In court, his defense lawyer told the court DeFeo was insane, that he'd heard the voices of his family plotting against him. He claimed he'd killed them in self defense. DeFeo was found guilty of second degree murder and sentenced to six concurrent sentences of 25 years to life. After the murders, the house sat empty for 13 months. 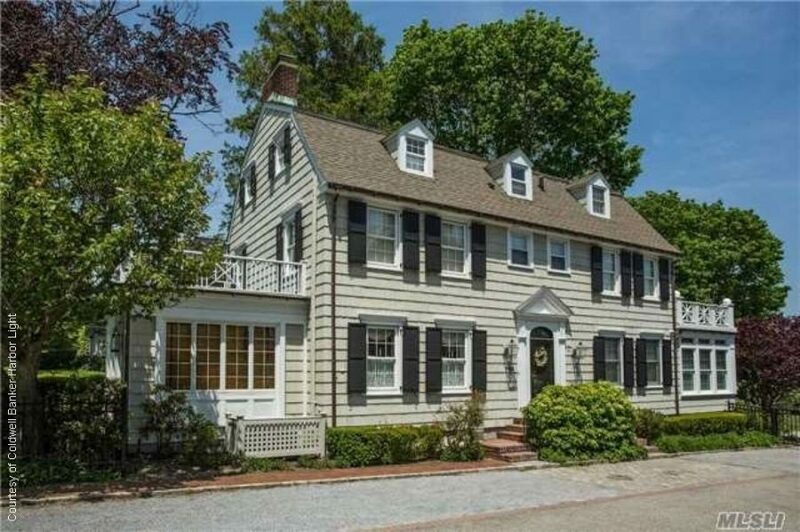 In 1975, George and Kathy Lutz were looking for a house and had a look at the Dutch Colonial home at 112 Ocean Avenue. The real estate agent told them about the murders, but they decided to buy it anyway. A book titled The Amityville Horror by author Jay Anson, published in September 1977, details the strange occurrences in the house experienced by the Lutz family. The Lutzes moved in on December 19, 1975, after paying only $80,000 for the home and an extra $400 for the DeFeo's furniture, which was still in the house. They hired a Catholic priest to bless the house, but he reportedly heard a male voice say "Get out" as he was praying in a second floor room that turned out to have been the former bedroom of the young DeFeo boys. According to the book, George would wake up each morning at 3:15 a.m., which was the time the murders were alleged to have occurred. Swarms of flies would appear, even in winter. He and Kathy claimed their five-year-old daughter Missy had an imaginary friend after moving into the house. Called Jodie, it looked like a demonic pig, with glowing red eyes. Green slime oozed from the walls. These were just a few of the events the Lutz family reported to have experienced. The Lutzes moved from the house after 28 days, claiming the paranomal occurrences were too terrifying. However, the book -- and the Lutz family's claims -- had skeptics. DeFeo’s attorney William Weber said the book and the subsequent 1979 movie of the same name starring James Brolin, Margot Kidder and Rod Steiger, were fictional, made up by the Lutzes. However, The Amityville Horror was the second-highest-grossing movie of 1979 (after Kramer vs. Kramer), taking in over $86 million. The movie was remade in 2005, again titled The Amityville Horror, this time starring Ryan Reynolds, Melissa George and Chloë Grace Moretz. An upcoming movie based on the events that supposedly occurred in the house is titled Amityville: The Awakening. Starring Jennifer Jason Leigh, it follows a single mother who moves into the house with her teenage daughter (Bella Thorne) and comatose son (Cameron Monaghan), when strange events begin to occur. The house has been owned by four different families since the murders. James and Barbara Cromarty bought the house in 1977 for $55,000 and lived in it for 10 years. They had the address changed from 112 Ocean Avenue to 108 Ocean Avenue to protect their privacy. They sold the house in 1987 for $325,000 to Peter and Jeanne O'Neill, who also lived there for 10 years. When the house was again put on the market in 1997, it sold for $310,000 to Brian Wilson, who made extensive renovations to the aging home. He sold it in 2010 for $950,000 to retired couple David and Caroline D'Antonio. At the time, Mr. D'Antonio told Long Island Newsday: "It is my dream house -- our dream house. There's nothing the matter with it other than the outside people." Mrs. D'Antonio put back it on the market in June 2016 for $850,000, following her husband's death in 2015. It sold in February 2017 for $605,000, even though other homes in the area have sold in the $900,000 range. Coldwell Banker Harbor Light listing agent Gerald O’Neill, who has lived in the area since he was a boy and even had a friend whose family owned the house prior to the DeFeos, told zillow.com that since the Lutzes moved out there have been no reports of paranormal activity. Great research, it's really interesting to see what it's sold for over the years.